Can anyone out there read Italian? Help us! As DiegoVoci™ historians we are seeking the truth. Did, or did not, artist Diego Voci’s deceased father, Giuseppe Antonio, have a brother? In the little town of Gasperina, Italy, resides an elderly gentleman in his nineties who claims he was the best friend of Diego and he insists Giuseppe Antonio Voci did NOT have a brother! 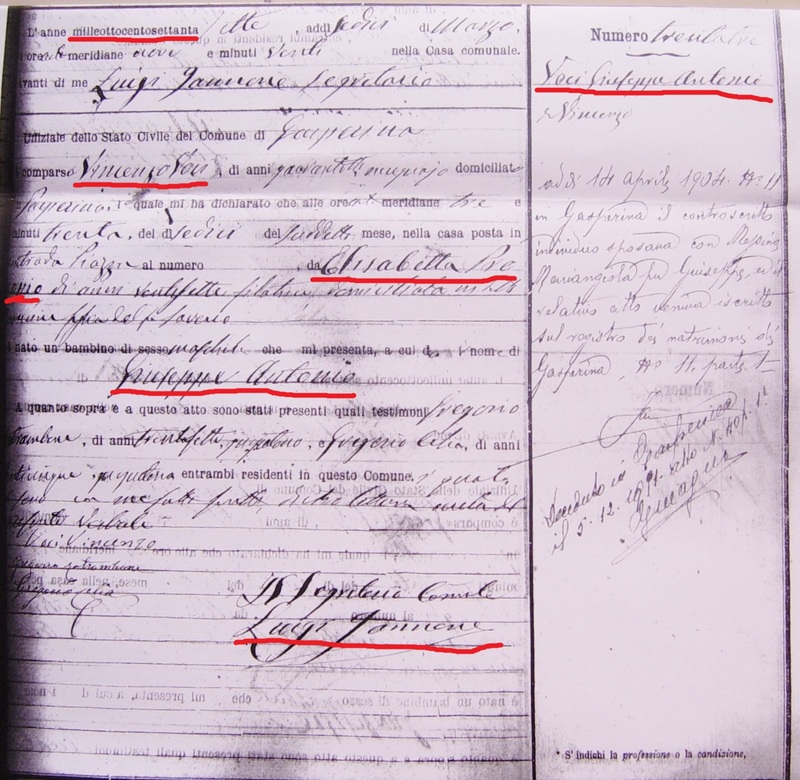 But, what appears to be the images of the official birth records going back 192 years to 1823 from the town’s Registrar of Vital Statistics (“Ufficio dello Stato Civile”) in Gasperina seem to indicate there was a brother named Saverio. Two sons appear to be born to the same mother and father Vincenzo Voci (1847) and Elisabetta (neé Procopia). One of the sons born 1877 was Giuseppe Antonio (Diego’s dad). The other son, Saverio Voci, was born 3 years earlier to the same mother and father. Therefore the official papers appear that Diego’s father Giuseppe Antonio did have an older brother named Savario. Help us with the Italian on the Birth Certificates. Is the Gasperina Registrar’s office in error? Or is the elderly gentleman mistaken? They can’t both be correct. It would be highly unlikely there were two sets of Vincenzo and Elizabetta in the same time period? Guiseppe Antonio Voci was born 1877 to Vincenzo Voci and his wife Elisabette (neé Procopia). 3 years earlier a Saverio Voci was born 1874 to the same parents as Giuseppe Antonio. 1a. Here is the 1877 signature of the Gasperina official on the birth certificate of Giusippe Antonio. 1b. 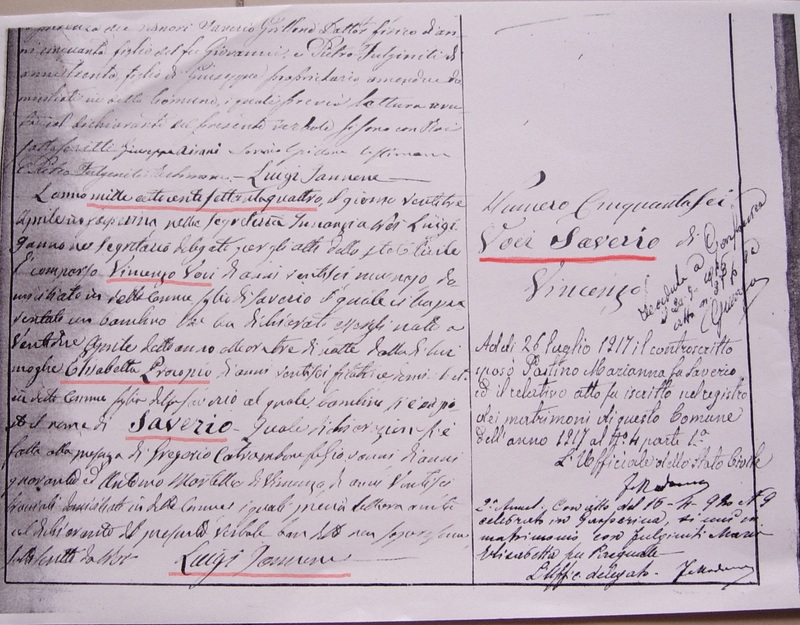 Here is the 1874 signature of the same official on the birth certificate for Saverio, with the same parents for both. The questions being asked by members of the Diego side of the Voci family are: Why haven’t we ever heard there was such a brother? And, if he did exist, what happened to him? Is the Saverio birth certificate suspect? Why? What do you think? We the DiegoVoci™Project think it is 99.9999999% true!